Assembly Required is a conference series produced by ThreeSixtyEight. 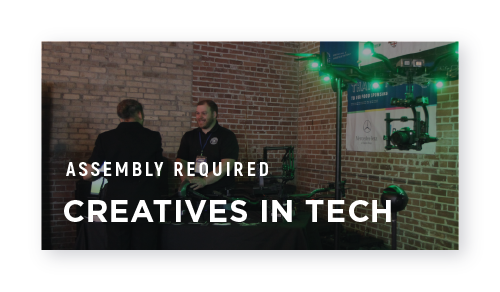 We are not “just another creative conference.” Instead, Assembly Required exists to gather people who want to creatively and actionably improve their communities. We facilitate this by hosting local gatherings that feature national speakers who bring an essential perspective to Louisiana locals. With every event we hope to attract talented people from industries that normally wouldn't meet. We believe that this combination will foster unique conversations that lead to real opportunities for positive improvement in communities of all kinds. For the 2019 season, Assembly Required is pivoting from large-scale quarterly conferences to four smaller, more intimate events that continue to drive the momentum we’ve built as a platform that connects and teaches leaders, creatives, innovators, and entrepreneurs. To kick off the season, our CEO Kenny Nguyen will share with the audience the Big Fish Presentations method that’s helped speakers from across the world present compelling arguments. For anyone that has to present their ideas, this is the session for you! This event will feature a workshop discussing obstacles teams commonly face that limit them from reaching their full potential and methods to overcome those challenges. Speakers to be announced! This event will feature a workshop discussing best practices in how brands utilize social media to drive sales + build brand loyalty. Speakers to be announced! Our concluding event of the 2019 season will feature an entrepreneurship panel, two national speakers discussing how creativity can boost business, and a special awards ceremony benefitting Junior Achievement’s Trust Your Crazy Ideas program. Speakers to be announced! ThreeSixtyEight creates unique digital experiences through beautiful websites, engaging video content, and measurable brand strategies. Complementing our digital services is the Big Fish Presentations service line, where we turn presentations into experiences using high quality presentation design, conference experience production, and public speaker training workshops. We seek to empower the state of Louisiana to embrace its creative confidence and chase after big ideas by uniting some of our state’s most creative and innovative talent. That drive led us to create Assembly Required. The Assembly Required series features diverse speaker talent.